Posted August 22nd, 2014 at 11:38 am | Log in to reply. My husband and I (both German) just love Korean food and culture, and our Korean isn’t to bad (his talking, my cooking ;-)). I really like your site (just prepared yeolmu kimchi today). I do wonder – why do you cook your fish that long? 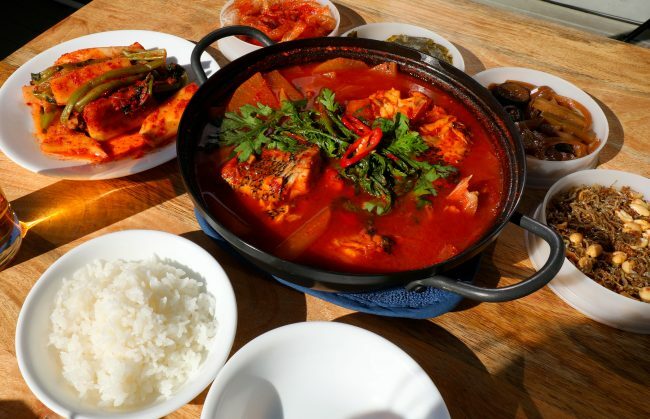 Whenever I prepare maeuntang or haemulchongol, I heat it all up until the fish and seafood (and dubu) are just done – that takes only a few minutes. Luckily, there is an excellent store for fresh fish and seafood nearby! Posted April 21st, 2014 at 5:06 am | Log in to reply. because red snapper is a kind of expensive fish. Posted December 18th, 2013 at 8:32 pm | Log in to reply. I have made this recipe three times now, with whatever fish, that was on offer at the store (after asking the guy behind the counter, what he would recommend for use in a soup). I make him filet the fish but keep the bones and the fish head, and just remove them along with the kelp. TIP! -Kelp (kobu) is a bit expencive here, so I DO NOT throw the kelp away! There’s still some good taste left in it!!! Instead I put it in the fridge and boil it again the next day or the day after, along with a small handful of dried anchovies, and a couple of dried shiitake mushrooms. Then I remove the anchovies and kelp. In the end, I add some doenjang or japanese miso along with whatever vegetables I happen to have in the kitchen that day. The mushrooms, I chop into small strips and add back in the soup. PS! -Thank you for doing this site. I’ve followed along on youtube for quite some time, and done a few of the recipes (mostly this one, and you kimchi recipes, that are much better than any other I have found on the net)… I’m very happy to FINALLY have come by your site as well… It is a very good site, and everything is so well maintained. I love it! Posted December 18th, 2013 at 8:38 pm | Log in to reply. PPS, I meant KOMBU not kobu. Posted September 11th, 2012 at 10:03 pm | Log in to reply. Loved this soup! The broth was so good and had many layers of flavor! The only thing I changed was i didn’t add shrimp i added squid that I cleaned myself! If turned out so so good! Also i just wanted to share that in my grocery store the Ssukgat was called Crown Daisy. Posted June 3rd, 2012 at 1:08 am | Log in to reply. I’ve just finished making this soup. It tastes great! I used the red snapper fillet instead of a whole fish, so it was very easy to make. Thank you, Maangchi! I love your recipe!! Posted April 23rd, 2012 at 10:55 pm | Log in to reply. This is a perfect recipe for me since I love spices. 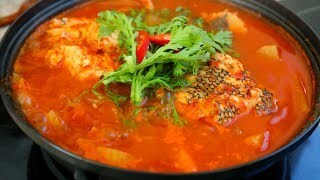 This recipe is also a healthy food because it contains fish, vegetables and other spices. We can actually add some oyster or other seafood. Thank you for sharing this recipe and I would love to share this to my family.Hope they would like spices too. Posted April 24th, 2012 at 10:36 pm | Log in to reply. Posted April 1st, 2012 at 12:00 am | Log in to reply. can I skip the cooking wine? Posted April 1st, 2012 at 9:16 am | Log in to reply. Posted March 22nd, 2012 at 9:29 am | Log in to reply. Who needs to get married!??!? I have maangchi.com! Posted February 27th, 2012 at 11:49 pm | Log in to reply. Posted February 28th, 2012 at 9:36 am | Log in to reply. Mince garlic and onion finely with a knife and skip kelp, it will still be delicious. Posted February 19th, 2011 at 9:18 pm | Log in to reply. Made this soup for dinner , it was delicious !!! I replaced minari with spinach and enoki mushroom with button mushroom . Everything turned out really good , we really enjoyed this soup , thank you Maangchi !! Posted February 28th, 2012 at 9:34 am | Log in to reply. Posted February 17th, 2011 at 4:20 pm | Log in to reply. Posted February 18th, 2011 at 12:07 pm | Log in to reply. Without kelp, it would be tasty, too. When you boil the fish for longer, you will get the nutrients from the fish bones and the broth will be tastier. Posted November 14th, 2010 at 6:41 pm | Log in to reply. i live in the caribbean so i doubt i can find ssukgat and minari…can i sub those items with something else? maybe with celery and parsley? i don’t know…i really want to make this dish but i’m not sure if its possible without those herbs? Posted November 15th, 2010 at 8:09 am | Log in to reply. Yes, it will still be delicious without using ssukgat and minari. Use more green onions. Parsley or celery sounds good to me. Posted November 11th, 2010 at 9:58 am | Log in to reply. Hope I did your recipe justice! Posted November 11th, 2010 at 11:11 am | Log in to reply. Posted November 11th, 2010 at 11:16 am | Log in to reply. Posted October 11th, 2010 at 10:02 pm | Log in to reply. Hello Maangchi. I LOVE your site. I love spicy food but my husband does not like spicy food. So I wanted to know if there is a way I can make this non spicy?? Thank you. Posted October 12th, 2010 at 7:20 am | Log in to reply. 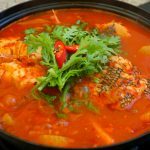 yes, of course you can make delicious non-spicy fish soup. You will have to find very fresh fish though. Skip spicy stuff. Posted September 28th, 2010 at 2:04 pm | Log in to reply. Posted September 29th, 2010 at 2:18 am | Log in to reply. kotgetang, sure someday! I love it, too!